The first day of school is such a rush. You need to remember exactly what time to set the alarm, exactly when the bus is coming, and exactly what to pack for lunch. Wouldn't it be great to take one moment to just pause during the first day rush? Hallmark has come up with a way to do just that. Hallmark created the Pics ‘N’ Props School Days Activity Kit. The kit comes with a chalkboard your child can hold, with cards that read each grade level, from pre-school to graduation. You can take one photo on the first day of school each year, then place it in the accompanying album. You can also fill out a card that summarizes your child's school year with things from teachers' names to friends' names. This is such a sweet way to look back on your child's education. 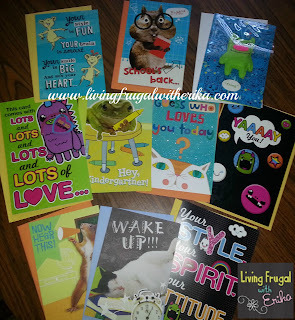 Living Frugal with Erika had the chance to review the awesome and adorable Pics 'N' Props School Days Kit. YOUR BLOG HERE is joining with Living Frugal with Erika to give away this activity kit -- plus a set of cards (including cards from the SO SO Happy collection) to give your child throughout the school year. ADD 3 -5 Sentences for SEO! One lucky winner will win this Hallmark prize pack. The giveaway starts now and ends at 11:59pm EST on August 17. To enter, just use the Giveaway Tools Form below. The winner must be a US resident who is 18 or older. The winner will be contacted via the email address in the Giveaway Tools Form and will have 48 hours to respond before another winner is selected. Failure to complete the mandatory blog entry comment will void all other entries. The mandatory blog comment is the only entry you MUST complete. All other entries are option to gain more entries in this giveaway! There are some options that have a daily entry option, so be sure to come back and get your daily entries! For additional chances to win, enter to win this same prize pack on Drugstore Divas and BB Product Reviews. My tradition is going to bed early and getting up and eating a hearty breakfast, then off to school.